EVERY other year the trade fair centre in Berlin hosts the world’s largest railway trade exhibition. 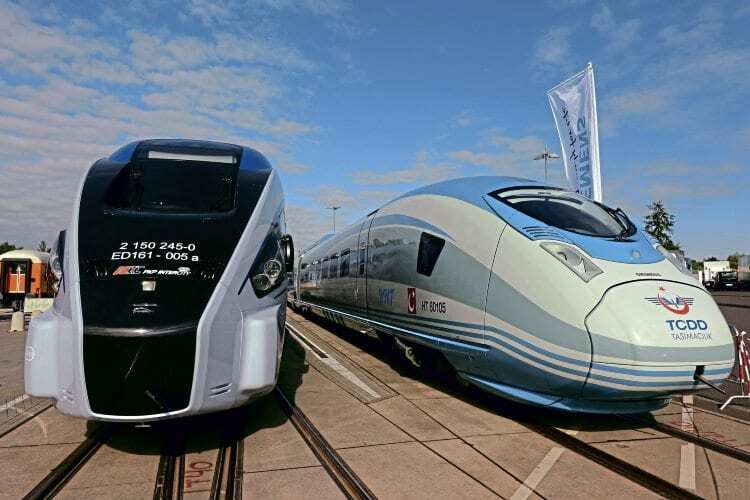 Many of Europe’s largest rail manufacturers use the show to highlight their latest products and future designs. Unlikely to ever be seen side by side again – Pesa-built ‘DART’ Intercity EMU, built for Polish long-distance operator PKP IC, alongside Siemens’ ‘Velaro’ YHT high-speed train, built for Turkish operator TCDD. The number of exhibitors at 2,950 was the highest in the history of the event, with more than 60 countries represented. More than 145,000 visitors attended the four-day exhibition, with people travelling from all over the world. Highlights of Innotrans 2016 included new 300kmh Siemens ‘Velaro’ high-speed trains for Turkish operator TCDD, plus the first public exhibition of the new 250kmh ‘Giruno’ high-speed EMUs being built by Stadler for Swiss Railways to operate services between Germany/Switzerland and Italy via the new Gotthard base tunnel.